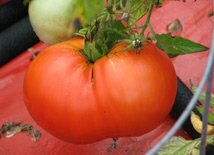 If you've shied away from growing heirloom tomatoes because they are more prone to cracking or disease than hybrids you ought to try the red Mule Team tomato. It's not unusual to harvest near perfect blemish-free fruit from this variety which also is tolerant of foliage diseases. The Mule Team is a high-yielding plant that produces all season and grows large 10- to 12-ounce fruit in clusters of three to five. It is slightly ribbed near the stem of the otherwise almost perfectly round fruit. The seeds are commercially available from several sources. It has a great flavor that is both acidic and sweet. I recommend buying Mule Team tomato seeds at TomatoFest because not only do they specialize in heirloom tomato seeds that are certified organic, but their service is great and their staff friendly.